Who’s that young man in the grip of Music? Jonathan Doyle, for certain. I first encountered Jonathan Doyle (tenor saxophone, clarinet, compositions, arrangements) through my friend, master percussionist Hal Smith — more about that later — which is a stellar recommendation. I then encountered Jon as the lead horn in a San Diego Jazz Fest session with Ray Skjelbred (another gold star) and most recently with the Fat Babies at the Evergreen Jazz Festival. Somewhere in this delightful process of admiration, I heard and loved Jonathan’s CD, THE FED HOP, and we actually had a short friendly conversation at Evergreen. His official biography can be found here. Jonathan is not one of those highly-schooled fellows who “understands” swing from a safe distance. Watch him on video for even eight bars, and you see that he is utterly immersed in it, his horn and his body in the grip of the most beautiful energies. He also surrounds himself with like-minded souls who obviously live for this kind of lyrical groovy experience. AND his compositions are quite wonderful: often subversively built on almost-familiar chord changes with titles that almost give the joke away. For instance, I think I’VE NEVER BEEN TO NEW YORK is a slow rock over the harmonies of ROSE OF WASHINGTON SQUARE, the results being satisfying and a well-executed in-joke. This band harks back to the Keynote sessions, to Basie small groups (with Basie himself smiling at the sounds but not at the keyboard), Benny Carter lines, and more . . . but they’re not in town to copy, but to evoke. And they do it splendidly. The swing heroes for this particular session, captured slightly more than a year ago at the Sahara Lounge in Austin, Texas, are Jonathan, tenor sax; David Jellema, cornet; Mark Gonzales, trombone; Brooks Prumo, rhythm guitar; Joshua Hoag, string bass; Jason Baczynski, drums. The very expert videos are by Gary Feist of yellowdogvideo.com. Hal Smith (mentioned admiringly above) has a new band, SWING CENTRAL, which features Jon as the sole horn, exploring the best floating small-band swing with a focus on Lester Young, Charlie Christian, and Pee Wee Russell. The other participants have been pianist Dan Walton, guitarist Jamey Cummins, and either Joshua Hoag or Steve Pikal on string bass. They’ve played at the Capital City Jazz Fest in Madison, Wisconsin in April, and they just had a gig at Central Market in Austin, Texas. Rumor has it that a few festival appearances are being discussed, as is a CD recording session. And — no rumor — I will have some videos from Austin to share with you in the near future. A band to look out for! Keep grooving with Jonathan Doyle and friends, wherever you find them. Jabbo Smith — that precise daredevil, that trumpet superhero — has often been emulated but rarely equalled. This hot little band in honor of Jabbo’s searing Rhythm Aces recordings does everything mere mortals could do in Jabbo’s honor, with delightfully incendiary results: Ben Cummings, trumpet / vocal; Jean-Francois Bonnel, reeds; Keith Nichols, piano; Jacob Ullberger, banjo; Phil Rutherford, brass bass. This session took place on November 2, 2013, at the Whitley Bay Classic Jazz Party. You might want to have an iced drink handy before viewing this set: it raises the temperature of the room precipitously. As brilliant as this hot evocation was, it wasn’t an isolated event at the 2013 Party (more videos to come as proof) and I know it will happen again, over and over in different contexts, at this year’s Party — details here. Thanks to Clint Baker and David Jellema for assistance and inspiration, as always. Festival promoters, swing dance bookers, people who love good music, beautifully played, take note! Who are these Swing miracle-workers? Why, they are the Thrift Set Orchestra, a band based in Austin, Texas. At their site, you can read the biographies of the individual musicians and learn more about the group. I don’t see a place where one can request an autographed picture of the TSO, but soon that will be necessary, as jazz and swing dance fans coast-to-coast get the message. 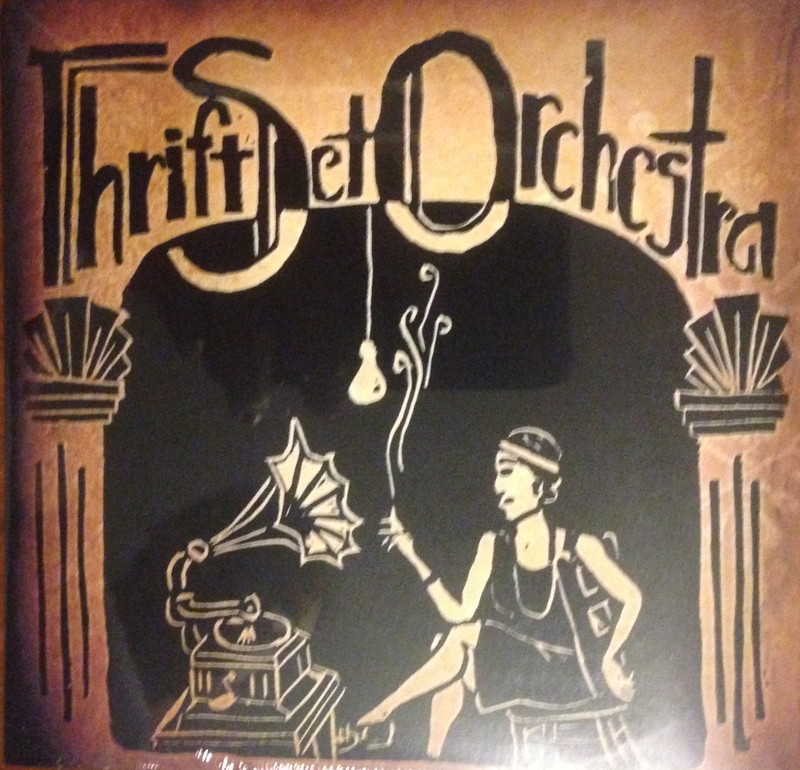 If the Thrift Set Orchestra looks familiar to you, it might be because I posted two versions of their THE MOOCHE in honor of the band and of Ellington’s birthday here. What makes them so special? I have to put them in context. There are many other youthful jazz bands out there devoted to the music of the Swing Era (and by that I do not mean formulaic versions of IN THE MOOD for dancers), and they all serve a useful function. But few of them play as convincingly and with as much inventiveness as the TSO. Some bands execute transcriptions of the original arrangements and recorded solos splendidly (no harm done there); other bands offer their own improvisations (likewise); some bands woo audiences with energy and vintage clothing or snappy uniforms and Art Deco stands (visually appealing for those who like spectacle). Back to the sounds. The TSO is a compact, energetic, and accurate jazz-swing orchestra, with players who can read and improvise in an idiomatic yet loose manner, and who can swing convincingly on their own solos. Their ensemble playing is authentic but not stiff, the solos inventive and personal. The band echoes Ellington and Bennie Moten, but it has its own Western Swing spiciness too. The CD offers a pleasing mix of classic songs and originals, as well as less familiar Thirties evocations (not copies) of Freddy Taylor, Cab Calloway, Bob Crosby, Jean Goldkette, informal sessions at Squirrel Ashcraft’s featuring Bill Priestley on cornet. Guitarist / vocalist Albanie Faletta sings deliciously on BLUE DRAG, and trombonist Mark “Speedy” Gonsalez plays Roy Eldridge’s ROCKIN’ CHAIR marvelously as a feature for the lower-register horn, getting every note splendidly in place. David Jellema’s cornet shines throughout, nimbly evoking early Hackett, and he adds his clarinet to the ensemble when a trio is called for. The two-man sax section of Graulty and Doyle, switching horns, is absolutely a model — and their soloing is individual yet idiomatic in the best way. Anchored by Hal Smith’s perfect drumming (you could listen to any of these tracks for the drumming alone and be refreshed), the rhythm section rocks — no pianists need apply. The overall sound of the band is both light and intense, and there is no hint of pretension or stiffness. They don’t sound as if they can’t wait to get back to their post-Coltrane modal studies. The rhythm section is powerful but never obtrusive, and the horns glide from lyrical solos to speaking gutty truths through their horns (trombonist Mark could be our generation’s Snub Moseley, and we welcome him!). The TSO, in addition, has the sound of a working band: people who are used to playing together and who enjoy each other’s musical company. Had this CD had simply been expert recreations of recordings, I would have been far less enthusiastic. Although eleven of the tracks here display some allegiance to recorded performances, each of them has small delicious surprises: brief horn solos where one wouldn’t expect them, a brief horns-only passage in SUNDAY; the welcome presence of a banjo on HELLO BABE; friendly adjustments, adaptations, and inventions: new touches that seem just right, something that Foots Thomas or Bill Challis would have liked just fine. Witty musical ingenuity rather than idolatrous museum-quality reproduction is the result. And in case you are someone with a record collection, muttering, “I’d rather hear the originals,” the TSO has some new originals to offer you, danceable melodies with memorable lines — most of them taking a single melodic phrase and moving it around in the best Waller style to create tunes that don’t leave your head. The musicians are David Jellema, cornet, clarinet; Jonathan Doyle, soprano, alto, clarinet; Lyon Graulty, tenor, clarinet, vocal; Albanie Faletta, guitar, vocal; Westen Borghesi, banjo, vocal; Ryan Gould, string bass, vocal; Hal Smith, drums, performing NOBODY’S SWEETHEART NOW / SURE FINE / BLUE DRAG / SHAGTOWN JUBILEE / ROCKIN’ CHAIR / SNOWBOUND IN A CABIN / SUNDAY / SUGAR / HELLO BABE / SWEET IS THE NIGHT / WHO’S SORRY NOW? / KRAZY KAPERS / HANG ON EVERY WORD / MAMA’S GONE, GOODBYE / ROCKIN’ IN RHYTHM / THE MOOCHE. Good sound from sessions recorded July 2013. You can purchase the CD here for $15 plus $3 shipping. I predict a brilliant future for the TSO. I’m delighted they exist. We need them — a musical embodiment of Bach’s Rescue Remedy. The TSO embodies a beautiful philosophy in their music.